Sonya's Food Blog | The greatest WordPress.com site in all the land! Started the day with an eggwhite and seasoned ham bagel. 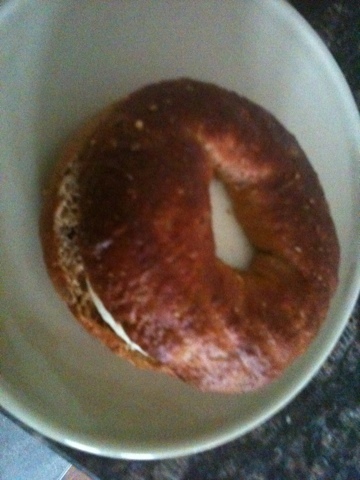 The bagel was huge. I had a hard time believing this entire meal was only 200 calories. Also had a very pleasant surprise on the scale. Since starting last Thursday, I’m down 7.4lbs. I can hardly believe it. 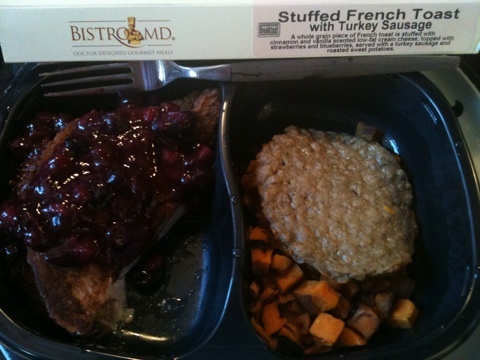 Well, I’m nearing the end of the meals I have on hand from BistroMD, so I’m trying to stretch them out until the next arrival scheduled for Wednesday. 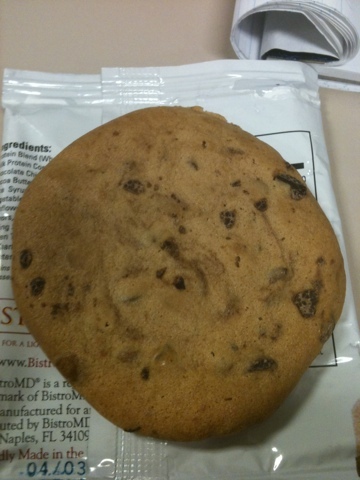 Soon after my snack, I had the BistroMD Cookie – 150 Calories. Texture was actually a lot better than I expected, this could be a go-to for cookie cravings. When I arrived home from work, my husband prepared dinner. 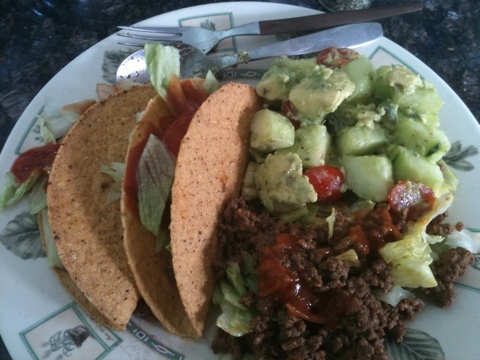 I had tacos (been so craving mexican food). What I noticed tonight that I was able to fill up on less food overall. Normally I would have gone back for seconds, and I did make a point to measure everything. Also had enough energy to take the dogs for a nice long walk after dinner, which was nice. Feeling sleepy today – my meals are currently de-frosting in the fridge for tomorrow. Pictures and totals are below. 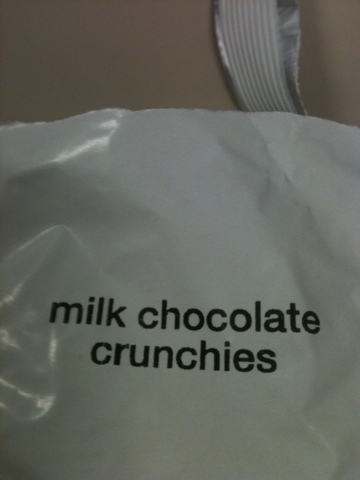 Milk Chocolate Crunchies… about 120 calories (estimate). Good, but annoying to eat at work. Would be perfect for movie night! Ok, I decided to reorder BistroMD. I called and placed myself on re-occurring status. That being said, I also learned that every person I refer will get a $50 credit if they say they were referred by me, and I will get a $50 credit for my order the week following. So, if any of these posts has piqued your interest, and made you decide that you want to have BistroMD delivered – consider this my referral. We both benefit and hopefully will keep on losing weight together. Send me a message at sonyasfoodblog <AT> gmail.com, as you will need to have my name to be referred. 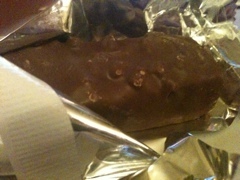 Ended the day with a “Mint Chocolate” Bar. Unlabelled package, but a quick web search makes me believe it has about 160 calories. End of day calorie totals are below. 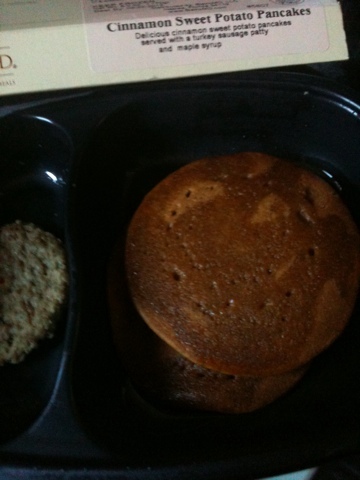 A bit lower than I expected to go, but most of the hunger pangs were gone today. I also ate breakfast much later due to sleeping in. Water intake wasn’t great, so I’ll work on that before bed to at least get me to 7 cups. 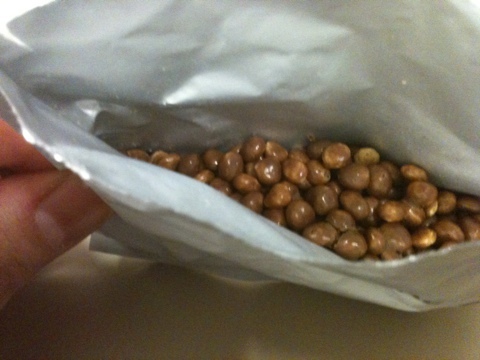 I banked one of the protein snacks provided by Bistro MD, but provided one of my own. End total is 2 protein snacks, one added fruit. Still getting about 10-20 less protein grams than I would like. But considering I usually hit 69 or so when eating on my own, the totals are not bad. This is also the first day I can remember coming in under my sodium goal! 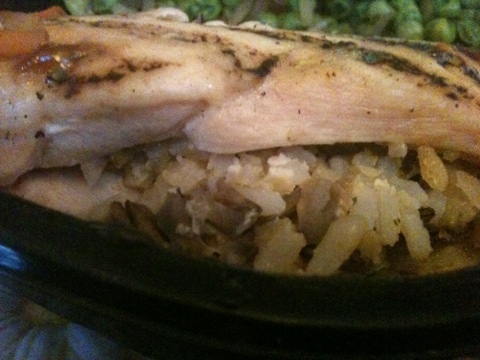 Tonight’s meal – Chicken Breast Stuffed with Brown & Wild Rice. So, my interest is now piqued a bit more. This dinner has to compare with what my husband is having as this is the first night he is cooking a warm meal for himself and not warming something else up in the microwave. I think it will, just because insert processed cheez name here is in the title. I’m not a fan of processed cheese in any fashion, and hopefully won’t be tempted tonight. I didn’t have my morning snacks today because I was up later than expected. 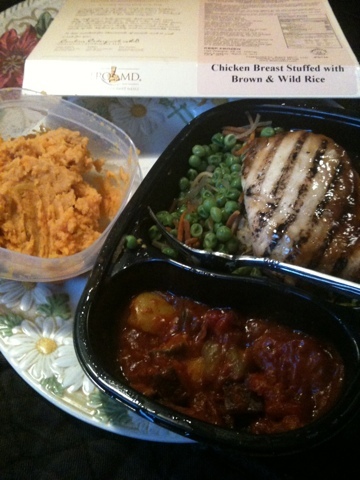 The chicken dish has 330 calories, but 760mg of sodium. This is the highest sodium content I’ve seen in a BistroMD meal so far. Others have been as low as 80mg. 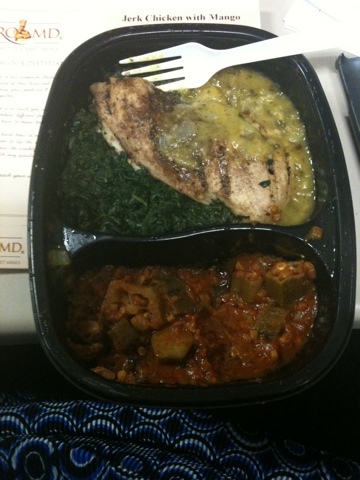 Also for dinner, instead of a fruit, I’m adding 1/2 of a sweet potato to the meal, bringing the total calories to 465. I will bypass the butter, but considering adding a bit of cinnamon. Well, I didn’t end up eating the sweet potato as it ended up on the floor. I guess that’s a sign. The meal itself was very filling, the stuffing very slightly hinted of garlic. The chicken had grill lines, and actually tasted grilled. It had a great texture. No gristle or anything else you wouldn’t want to find in a prepared meal. Another excellent dinner. 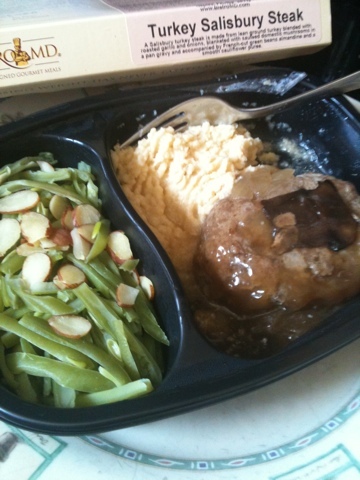 Turkey Salisbury Steak with French Cut Green Beans & Cauliflower puree. Overall, a good but awkward meal. I followed the heating instructions (3 minutes if defrosted)- which worked for the veggies. Took a bite of the “steak” and it was still cool. I cut it in half, warmed the meal for another minute. It felt fine, but immediately cooled down once I took my seat. I didn’t want to reheat the entire meal again since the veggies were perfectly cooked and would have dried to nothingness.I ended up eating the veggies, then reheating the “steak” another minute. I actually find it hard to believe that it was only 240 calories, and as filling as it was. The best breakfast yet. Stuffed French Toast with Turkey sausage and Sweet Potatoes. 330 calories.